Who says you can't teach an old dog new tricks? 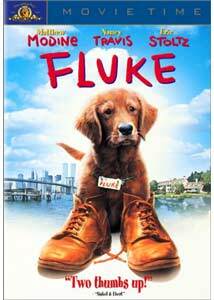 With a picture of a puppy on the cover, Fluke looks like it should be another of countless dog movies, relying on the cuteness of its star to make it a family draw. This, however is not your average animal film, and parents should heed the PG rating, as there is some disturbing content here that may not be appropriate for young children.Winding down a two lane road at night, two cars travel at high speed, side by side. The occupant of one, Thomas Johnson, is yelling at the driver of the second. The headlights of a truck appear in his lane and he veers off the road, over an embankment, head first into a tree—and dies. A flashback to 2001: A Space Odyssey later, and we see a new perspective—the puppy cam. Our character has been reincarnated as a dog; unfortunately, he is the pup of a stray, who lives in the back alley behind a restaurant, and like all strays, it's not too long until his mom and siblings are caught by the pound. Out on his own, he runs into an old woman who lives on the street, panhandling by playing a shill game. Pup has a knack for guessing where the shill is, and gets dubbed "Fluke," but life on the street is rough, and one night the woman goes to bed—and dies. As they cart off the corpse, Fluke meets Rumbo (voiced by Samuel L. Jackson), another older stray who advises Fluke to abandon his home or risk the pound. The two set off on a tour of the local markets where Rumbo has his human connections, but Fluke is having weird dreams, and wonders if he has always been a dog. When a run-in with some bad guys doing tests on animals results in Rumbo being killed, Fluke sets off looking for the people he has been seeing in his memories. Eventually he makes his way to the school where he finds his former son and wife. He follows them home, only to discover that his wife is now seeing the man who ran him off the road, who turns out to be his old business partner. Can Fluke rescue his family from a murderer?As I said earlier, this is not your typical cute puppy flick. After running the gauntlet of clichéd dog movie hazards, the film finally settles into a fairly decent fantasy storyline. Matthew Modine (Full Metal Jacket) plays the ill-fated father, and does the voice over for the dog, with Eric Stoltz (The Fly) as the man in question. Nancy Travis (Beyond Suspicion) plays Modine's former wife, and Ron Perlman (City of Lost Children) is the animal experiments baddy. The biggest downfall is lapsing into standard tearjerker segments; not that they aren't effective, but they seem too contrived and too frequent. The camera work is quite good, offering an interesting variety of perspectives, and the acting holds up, with the dog stealing the show. As a glimpse at the possible afterlife, it grinds out the morals incessantly, but does touch on some universally worthy themes. In the end, Fluke redeems itself, but the opening third had me questioning the target audience for this one. Knowing what I do now, this could be an enjoyable rewatch. It certainly is different from any other dog movie I've seen. Image Transfer Review: The film is presented in an (assumedly) open matte transfer, although several scenes look a little tight in composition when matted. Colors are vibrant, and detail is good. There is a moderate degree of aliasing, and fine grain is present but natural. Defects are negligible, with compression issues also minor. I would of course have preferred the correct ratio. Audio Transfer Review: English audio is presented in stereo surround. The track is clean, with a good sound stage, and a decent amount of directionality across the forward field. Dialogue is easy to discern, and the mix balance is tonally pleasing. French and Spanish mono tracks are also available, and both have a similar quality to the English track, less the stereo perspective. Extras Review: A trailer is the only extra. This doesn't even come with an insert card for chapter listings. Fluke was not at all what I had expected. While it turned out to be a pretty good picture, the thematic elements early on had me shaking my head given the obvious targeting at young children the cover provides. This is a story for adults, giving an often poignant perspective on life, loss and appreciating those around you, but often is pulled down by forced melodrama and obvious emotional manipulation. Now that I know what happens, I'm sure I could enjoy the film a lot more, but this gets a guarded recommendation at best, especially for kids.